Siem Reap was once upon a time just a sleepy little town in Southeast Asia, virtually unknown and ambiguous to the world. Cambodia was extremely poor and still recovering from its scars from the horrors of Pol Pot’s genocide. Siem Reap was just a quaint little village in the northwest region with 900-year-old temples. No big deal, nothing to offer here. All that changed when Angelina Jolie visited Cambodia to film the Lara Croft movie. The movie catapulted her to fame, and went with it Cambodia’s fame as the next big tourist destination. Siem Reap is now a thriving resort city–boasting a number of hotels, resorts and restaurants for tourists. Siem Reap is the gateway to the Angkor region, where the famed Angkor Wat temple complex is located. 1. Travel with someone with the same wavelength as you. The decision to travel to Cambodia was spur of the moment. It probably was a bit of post-partum, but early 2014 I felt like I was stuck in a rut. Feeling broke and depressed—I decided to book a ticket to Cambodia. I didn’t even stop to think. I had to do it. I invited one of my best friends, Aya, to come with me. Equally broke and depressed, she immediately agreed. ‘Winging it’ is vital to survival when you’re two broke girls abroad. It takes a little bit of charm and boldness, and requires a bit of beauty and brains (oh snap was that a humblebrag?) to get away with getting sweet deals. Aya: Where do you want to eat? Rachel: I don’t know, wherever, you? Rachel: No, I don’t mind, you? A big thank you to our tuktuk driver Kapouv for making most of our dining decisions and taking us to great places to eat. 2. Book with Cebu Pacific. To get to Cambodia, you’ll have to fly via Cebu Pacific–a budget airline with good rates. The airline pioneered direct Philippine-Cambodia flights They run Manila to Siem flights Reap four times a week. We were able to get a P399 promo to fly to Cambodia, or P4,150 roundtrip with VAT, etc.Other expenses not inclusive: travel tax (you have to pay P1,620 at the airport) and Terminal fee (P700). We did not avail of food or check-in luggage (because backpackers). If you’re unfamiliar with the travel concept, couchsurfing is a global community of travelers. Hosts offer travelers to crash in their homes for free. Ideally, hosts are also couchsurfers when they’re traveling abroad, and vice versa. Couchsurfing significantly reduces your travel costs because accommodations are made free! Even if you don’t have plans to couchsurf, you can still check out the site to meet like-minded people, have dinner with fellow travelers, go on a day tour with the locals. CS groups hold frequent meet-ups in several cities worldwide. Couchsurfing has a great and thriving travel community. We met our tuktuk driver Kapouv through the site. He gave us a really good deal on a daily flat rate. His tuktuk also offered shade and free water for his thirsty riders. He was nice, patient and insightful. I would recommend Kapouv to anyone. We also met Kuwait-based Berlin Calderon who was solo-backpacking across Southeast Asia. He later joined us in Siem Reap on our third day. Berlin was the life of the party! Sometimes he made us feel like grandmas. It was good he came with us later on because he made the decisions and eased us off the burden of our un-decisiveness. The room we booked was a double private room with bathroom for 14 USD a night. The room didn’t have AC, but it had a fan and sufficed. But be warned, this hostel does not sleep. But the managers sure know how to throw a good party. Mad Monkey boasts a rooftop beach bar, a pool, sundeck and a three-meter beer hose. Mad Monkey crowd is young, with all the energy and blissful ignorance. Mad Monkey is like spring break for the I’m-a-university-student-from-a-first-world-country-currently-on-gap-year-searching-for-an-epiphany-so-I’m-traveling-to-a-third-world-country kind. It is tempting to just stay in all day, gawking at people. Guests of the hostel are given one free craft beer every day of their stay which you can redeem at the banana bar or rooftop bar. If you ever get the chance to stay here, do the grenade shots! They keep a scoreboard by the bar that keeps tabs on the number of grenade shots done by country. Netherlands and USA was on the lead during our visit, and Philippines only had a meager 9 points. Help our country redeem itself! We finally met some lovely Filipinos! Beautiful model Nikita McElroy, for one! Khmer cuisine is great, I can attest to that. Khmer cuisine shares many characteristics with their neighbor counterparts–infusing influences from Thailand, India, China and Vietnam. The Khmer palate is, for the word, ‘subtle’ in comparison to other neighboring cuisines. This doesn’t mean Khmer food is inferior at all. It’s neither as spicy as Thai, not as rich as Indian, not as umami-loaded as Chinese, nor as salty as Cebuano. Cambodian tastes are subtle but the flavors feel ‘purer’. Fresher. What’s interesting to me is how Cambodian restaurants, even the humblest karenderia-types, have a complete array of condiments and accessories for their customers. In every table, you’ll see a dispenser with floral-scented napkins, hot water, utensils, chopsticks, and the condiments black pepper, salt, lime juice and their special Khmer fish sauce. Below our table is a small trash can where we can dispose our rubbish conveniently. Philippine restrooms can’t even provide toilet paper and working tap water. We should be ashamed. 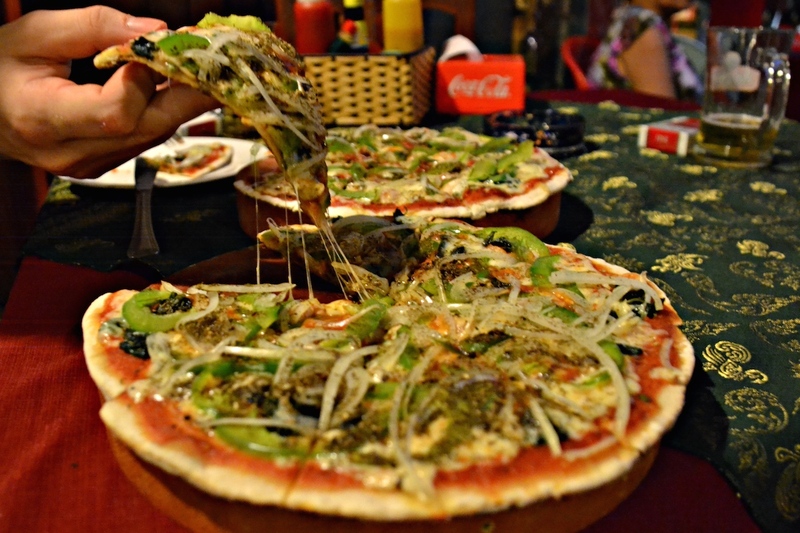 When in Cambodia, you’ll have a high time with their famed ‘happy pizza’. Basically, it’s pizza garnished with cannabis. Yep, they’re pretty lenient with that stuff here. Locals use hemp for cooking some dishes or as a therapeutic herb. Best of all, you get to choose on how ‘happy’ you’ll want to be, from ‘miserable’ to ‘extremely happy’. We chose the latter, but instead of being ‘extremely happy’ we became extremely drowsy instead. You’ll find several happy herb pizza places around Siem Reap’s Pub Street. Happy pizza normally costs US $6-$8. Food in Siem Reap isn’t expensive and cost somewhere between US $2 to $5 in restaurants. Popular dishes are the Fish Amok, a national dish made of fish, coconut milk and curry paste, and Lok Lak, stir-fried beef in brown sauce. Street food in Cambodia is cheap and delicious! My street food favorites are the Khmer banana pancakes, fried bananas and good ol’ stir fried noodles. Cambodians enjoy sour fruit too! They like unripe fruits (like mangoes and tamarind) sprinkled with a chili and salt mix. I love the Khmer version of halo-halo too! Still, there are better options to stretch that buck: stay away from the tourist traps. Go where the locals go! On several occasions, we asked Kapouv to take us somewhere with good and cheap food. Kapouv led us away from Siem Reap central and into the outskirts of the city. He took us to Siem Reap’s local hangout called ‘Route 60′ where we got to experience the local life. You’ll see the Khmer people having picnics and barbecues with family and friends. There are family-friendly carnival rides and a la budots music blaring on the speakers. Here you won’t find westerners here gawking at the area like a tourist attraction. Since Filipinos and Cambodians look alike, we blended in easily. Route 60 is the best way to experience Cambodia the local way. Authentic Khmer food was sold at US cents price! A personal favorite of Aya and I are their chive cakes or Nom Ka Chai. You can get stuffed here for US 25 cents or 1,000 Cambodian Riel. At Route 60, we also got our first taste of fried insects. The street vendors sold juicy crickets, beetles, silkworm, red tree ants, snakes, frogs and tarantulas—all at a very good price. 6. Angkor Wat Of course you can’t travel to Cambodia without seeing the Angkor Wat. It’s a magnificent (and massive!) temple complex built in the early 12th century as the then-king’s state temple and eventual mausoleum. The Angkor Wat is the national symbol of Cambodia, and is represented in their flag. It is the largest religious monument in the world. In Angkor Wat you will witness beautiful sunrise and sunset views. I advise to see it at sunrise (leave 4:30 am) to catch the beautiful sky hues. The only expense we couldn’t escape was Angkor Wat. For US $20 (one day pass), it was the highest expense of our trip. If you can’t afford a tour, follow one of the several group tours and pretend to be part of the group. There are group tours done in several languages (English, French, Spanish, Nihonggo) in case you want to learn a new language too. Fortunately we weren’t that desperate and decided to get a tour guide. There are official tours and group tours, and also hustling locals waiting outside the temple offering their services. We got a local guide who was a young university student to take us around for $15. I’d like to share more about the history and culture behind Angkor Wat and Pol Pot. Shopping in Siem Reap was heaven for us. Their bazaars have a cool array of clothing and souvenir items: antiques, crocodile leather, paintings, Cambodian silk and more. The Cambodian pants they sold in bazaars were lovely, and Aya and I bought three for $3-$5 each. We bought a few pairs to use while touring around. It’s hot and humid in Cambodia plus you can’t really wear shorts when visiting temples. The Cambodian pants were perfect for touring around because they’re comfortable, airy with the right skin coverage. We also got these nice rice sack / cement sack bags handy for keeping our money, phone, camera and water bottles in place. While these items can also be found in flea markets of nearby Southeast Asian countries, I appreciate how the Cambodians are still nice and timid, and shoppers don’t feel pushed to buy. They aren’t as aggressive, pushy or demanding like the Chinese in Hong Kong gadget shops or their Thai neighbors. No one yells or gets furious at you. Of course most tourists travel to Siem Reap to see ancient temples. But if you think there’s not much to do in Siem Reap after dark you’re wrong. The city is a tourist area and has a very lively nightlife. Angkor What? is the liveliest bar in the street and claims to be ‘promoting irresponsible drinking since 1998’. Apart from their repetitive and somewhat outdated playlist (the dance music were from five years ago), it’s a good place to meet people. Angkor What? is famous for their beer and cocktail buckets (around $4-$5) and energetic crowd. 9. I admit, we cheated a little bit. While we lived the broke backpacker lifestyle for most of the trip, it’s nice to treat yourself once (or twice during) a trip. And if you want to cheat, do so at Blue Pumpkin. So we only brought P6,000 cash, but a credit card on hand can call for an unplanned cheat day. We didn’t say we regret it though. Blue Pumpkin food is soooo good. Their desserts are heavenly. I swear, Blue Pumpkin furniture are built for customers to stay there forever. It doesn’t help that their couches are way more comfortable than our hostel bed. While it seems like we’ve done a lot of crazy things on this trip, it pays to know your boundaries. Maturity teaches you that you can’t do everything recklessly. So even if you’re YOLO (excuse me for using that horrible word), practice Repsonsible YOLO. We were able to cover a lot of things on our six-day Siem Reap Cambodia Budget Travel guide. Hopefully we can help you make the most of our buck! What are your favorite things about Cambodia? hi miss! I love your blog! I’m using it as one of my research materials in preparation for my exchange program in the Netherlands. I was thinking of starting a blog about it soon. Anyway, I love this post because Cambodia is one of the places I would love to go to. My friend recommended it to me. It was her favorite asian country. So i went to research about the place and found out about their most horrific and tragic past. Not more than 40 years ago, the nation suffered the wrath of the Khmer rouge. They had so many people executed like what happened in the holocaust. There is a museum called tuol sleng (I don’t know if you were able to visit it) the museum featured detailed photographic documentation of the victims. Gory, haunting and morose, but I like knowing about places. Thank you! I cannot wait to know more about your Netherlands experience! You are going with Micmic right? Yes, I did write a brief historical background on Cambodia but related it to their food. They discovered insects as integral to their diet during the Khmer Rouge because food was scarce and they were starved by the dictatorship. Pretty interesting! I think that museum was in Phnom Penh which we didn’t get to go to already because it was a 3 hour bus ride away. If i could come back it would definitely be worth the visit though! Nice blog! You really nailed giving me the good things to do in Siem reap for a very good budget. I wonder if you spent Php6000 per person or for 2 already? I am planning to go to Cambodia for 5 days, and this blog really helps me in organizing my trip. Thank you very much! Just per person 🙂 We did a lot of partying and shopping in between that, btw 🙂 thanks for reading! Thank you bel! Share your experiences with me when you can! How much did you pay for 2 people for round trip tickets? Thank you!